Michele Neylon is the founder, owner, and CEO of Blacknight, Ireland’s largest domain registrar and hosting provider. Michele is an active and outspoken member of the Internet industry. In January 2017, Michele was elected the 2018 Board Chair of the i2Coalition. He currently serves as the i2Coalition Board Chair and Best Practices Working Group Chair. He is also the recipient of the 2013 IIA Net Visionary Award. Michele is actively involved in Internet policy development, currently serving on the counsel of the ICANN GNSO. His focus is primarily European Internet concerns and policy. 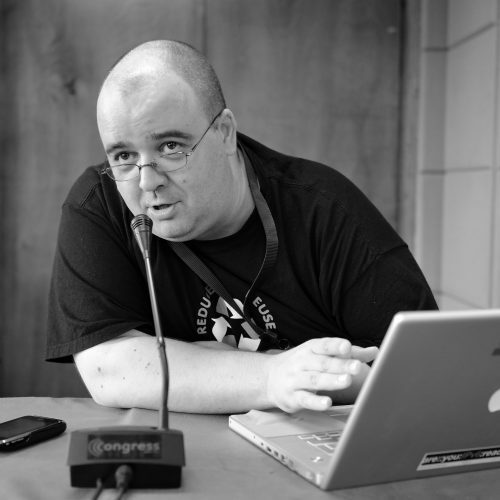 He has presented at numerous Internet industry events with topics including policy, security, ICANN, Nominet, the Internet Governance Forum and Investment/First Tuesday. In his spare time, Michele is a multilingual, award-winning, social media evangelist, blogger, and film buff. Michele Neylon is the founder and managing director of Ireland’s largest registrar and hosting provider Blacknight. Michele is an active and often outspoken member of the Internet industry. He has presented at numerous internet industry events, covering a range of topics including policy, security, ICANN, Nominet, the Internet Governance Forum and Investment/First Tuesday. Michele focuses primarily on European Internet issues and policy as well as serving on the Eurid registrar advisory board and the ENUM 353 policy advisory board. He is an award-winning social media evangelist and blogger as well as a film buff who speaks four languages. Michele is also a passionate philanthropist, sponsoring events such as EarthRace and 24 The Web.